Mill Creek High School is located northeast of Atlanta in a rapidly growing section of Northern Gwinnett county. MCHS opened its doors in the fall of 2004 and has quickly grown into a 7A high school serving over 4000 students in the Hamilton Mill area. Since the school opening, the Mill Creek Band program has experienced exponential growth in enrollment and has established a tradition of excellence in all aspects of the band program with superior performances in marching, concert and jazz mediums. The 240 students enrolled in the band program participate in curricular and co-curricular offerings that include 4 concert bands, the Pride of Mill Creek Marching Band, Jazz Band, chamber ensembles, multiple percussion ensembles, three Winter Guards and WGI Winds. The Pride of Mill Creek marching band has earned competitive success and helped to establish a sense of identity and pride in our school. The Pride of Mill Creek has performed in the 2008 New York Saint Patrick’s Day Parade, the 2010 London New Year’s Day Parade, the 2013 Frascati, Italy, Street Show, and the 2018 Paris New Year’s Day Parade. The Pride of Mill Creek is a five time Bands of America Regional and Super-Regional Finalist and a three time BOA Regional Class AAAA champion. The symphonic programs at Mill Creek has earned a high level of respect around the state and region through its consistent Superior rated performances at the GMEA Large Group Performance Evaluation. 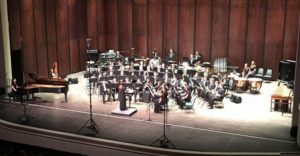 The Mill Creek Wind Ensemble has given invited, guest performances at the 2017 Georgia Music Educator’s Association In Service Conference, 2015 and 2017 Music for All Southeastern Concert Band Festival, Columbus State University, Kennesaw State University, Georgia State University, and at the 2011 University of Georgia Janfest. In addition to group achievements, MCHS band students have been chosen through competitive audition to be members of the Metropolitan Atlanta Youth Wind Ensemble, the Atlanta Youth Wind Symphony, the Atlanta Symphony Youth Orchestra, the Georgia Governor’s Honors Program, the GMEA District Thirteen Honor Band, and the GMEA All-State Band. The Pageantry Arts programs of the MCHS Band program have also enjoyed an outstanding level of success in their activities. The MCHS Winter Guard was formed in the Winter of 2007, and in their first year of existence group earned a Silver Medal at the Southern Association of Performing Artists Championships held in Macon, GA. Since its inception, the winter guard program at Mill Creek has grown to include over seventy students and has been a five time Winter Guard International World Championship Finalist. The MCHS Jazz Band maintains a busy schedule in the winter and spring performing around the community. In 2015 the newly formed Mill Creek Winds were named Class A Champion for the Southern Association of Performance Arts.